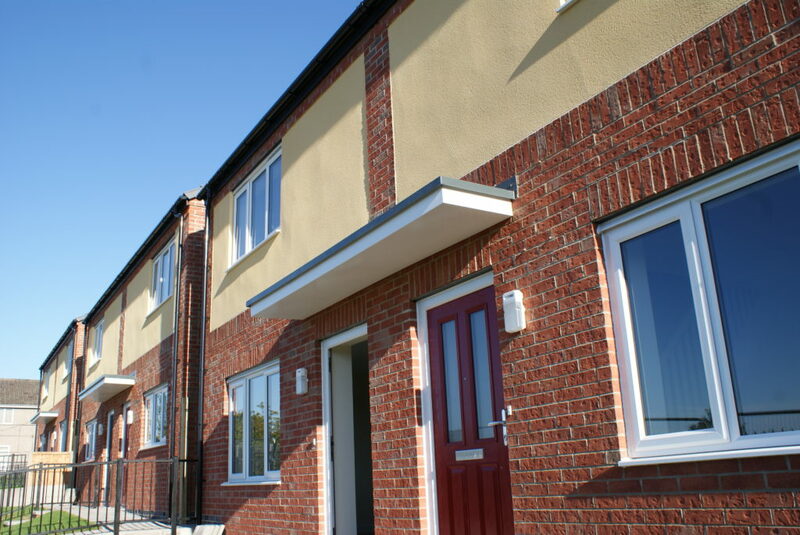 The Build a Better Nottingham programme is gathering momentum as more brand new council homes, completed by Robert Woodhead Limited’s sustainable arm Woodhead Living become ready to let. Eight new two bedroom family homes have been built on a former disused garage site on Henning Gardens in Top Valley. Nottingham City Council (NCC) and Nottingham City Homes (NCH) are working together over the next four years to transform Nottingham’s neighbourhoods. The Build a Better Nottingham programme will see more than 350 council homes built across the city. Work started last year on the first phase of the programme, which includes 26 properties built on four disused sites across the city. This £2.85m phase is being carried out by Woodhead Living the specialist sustainable arm of Nottinghamshire-based construction firm, Robert Woodhead Limited. The contractor is committed to investing in Nottingham and made sure 100% of the labour, plant and materials was sourced from within 20 miles of the site. Four bungalows at Geraldine Close in Bestwood and two bungalows at Keverne Close in Aspley, have already been completed and have tenants living in them. The final site in this phase of the programme will be completed at the start of next year on Windmill Lane in Sneinton. Councillor Alex Ball, Executive Assistant with responsibility for Housing and Regeneration at NCC, said: “Although eight new homes may seem like small numbers in the context of such a big programme, these smaller sites are incredibly important. During various stages of the build, Robert Woodhead Ltd invited pupils from the local Big Wood School and apprentices from Vision West Nottinghamshire to spend time on site learning about the building trade (pictured). Nick Murphy, Chief Executive of Nottingham City Homes, said: “We are not just building houses, we’re transforming communities across the city. It’s important that with every site we build on, there are training and employment opportunities for local people. For the majority of the students, it was the first time they had been given the chance to visit a working site. Bob Chadwick, Site Manger on the Henning Gardens Site commented on the project. “We involved the local schools as we believe that construction projects present a great opportunity to get them on site to see what its like on a working site and encourage young people and apprentices, the workforce of the future, into construction. We also donated surplus materials to Big Wood School to help with their B tech course. One of the stand out achievements was receiving 41/50 in the Considerate Constructors Scheme. We are really pleased with how it all went, the sustainable technologies should help to reduce energy bills for the tenants and having had chance to meet some of the new tenants it was clear to see that these new homes will benefit Nottingham for generations to come.